When laying out your marketing strategy, it often feels like you have nothing and everything to go off – historical numbers, KPIs, industry projections, social platform claims, and so on. One of the best ways to benchmark your plans is by looking at what other marketers are doing, but that insight can be difficult to get a hold of. Luckily, HubSpot, an inbound marketing and sales platform, surveyed 350+ companies for their new Demand Generation Benchmark Report. We’ll dive deeper into the results, but first, let’s take a look at the key numbers and takeaways. Halted growth for larger companies – Smaller organizations are more likely to exceed revenue expectations, while larger organizations seem more likely to achieve, but not exceed, their revenue goals. Larger companies pay higher costs per lead – The largest organizations (1,001+ employees) generate greater web traffic, more leads and more customers per month, but pay a higher price per lead. Leads are crucial for revenue – Organizations that fail to meet their revenue goals tend to generate fewer leads and sales opportunities in spite of having similar website traffic to more successful organizations. Open rate and click-through rate for email campaigns are also significantly lower for organizations not meeting revenue goals. Content hugely impacts success – Organizations exceeding their revenue goals are more likely to use content creation, online advertising, and branding/public relations marketing tactics, with content creation leading the pack by a substantial lead (as shown in the graph below). As we previously covered in our post What’s A Good B2B Conversion Rate in 2017?, understanding results by respondent, company size, and revenue is helpful, but often, numbers by industry are most relatable. The graph below lists the industries included in the study, along with data on whose exceeding or falling short of revenue goals. But again, how are marketers achieving these numbers, or what may be causing them to fall short? As shown in the table below, tactics vary by industry, but content creation rose to the top for consumer products and marketing agencies, while other top performers like financial services and industrial and manufacturing rely more on PR and branding and email marketing, respectively. Website optimization came out high on the priority list, but few people listed SEO in conjunction with optimization, a sign that though companies are making efforts, they may be overlooking important factors. Now let’s talk leads per month in terms of the most valued – marketing qualified leads. The IT and services sector wins this one with a mean of almost 7,000 leads generated per month, and nearly half of those marketing qualified leads. Marketing agencies are focused on quality leads to begin with, but need to figure out ways to increase the number of monthly leads. Hubspot suggests companies look into marketing automation as a tactic to improve their lead to qualified lead conversion rate. Here’s a clue as to why the IT and services sector is pulling in such a high number of qualified leads: marketers in these sectors are paying a lot more for them, as shown in the graph below. Notice the lower CPL for Consumer Products and Marketing, though. As we highlighted above, those two industries rely more heavily on content marketing as a top tactic. For that reason, companies looking to lower their CPL (and who isn’t?) should pull back on traditional and paid tactics and introduce more inbound techniques. Perhaps the most intriguing and useful part of Hubspot’s report is the section broken down by over and underachievers, which examines the marketing tactics used by the two groups. 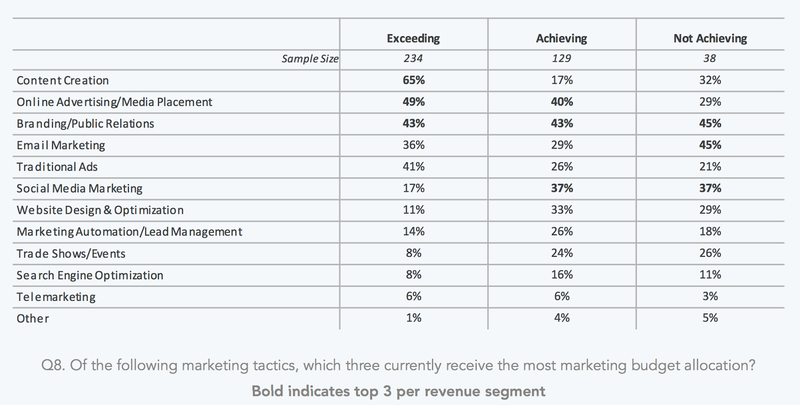 As shown in the graph below, top tactics used by organizations exceeding their revenue goals are content creation (65%), online advertising (49%) and branding/public relations (43%), while the underachievers are spending time on branding/public relations, email marketing, and social media. If the majority of your budget falls into email marketing or social, consider shifting dollars to one of the categories that’s yielding better results for competitors. You can read the whole report here, including a look at the numbers broken down by organization size and overall revenue.